This is no Nancy Drew story. Sometimes I open my wardrobe and think how did I acquire so many shoes? Then I look at them closely and realise I haven't worn half of them and should really get rid of them. Yet, who would buy a pair of small size 3 shoes? Or an unworn pair of gingham Converse (still in box). 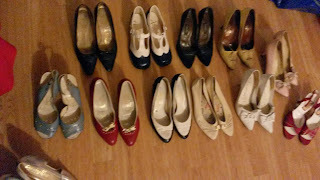 It seemed to me that the only shoes I actually wear are my vintage ones. Now, why is it that people with smaller feet should struggle to get shoes that fit properly? No one caters to this on the High Street, its all size 3 upwards. Yet this is no use to the small amount of us who have petite feet, what are we supposed to do? Walk around in shoes too big? There is nothing more degrading than walking into a shop and asking very politely for size 2 shoes to be told that "you need the children's section." Not only is this bad service, it also shows a complete lack of interest in supplying for those who do not have average sized feet, the excuse of looking at children's shoes is wearing thin, and to those shop assistants who have told me this, I say to them "how would you like it if I told you to look in the mens section for trainers for girls with big feet?" It's the same principle. Yes, there is an argument that there are a few online boutiques who provide for petite sizes but how am I supposed to buy a pair of shoes without trying them on first? That is simply ridiculous. Also, why should I have to pay almost double for a pair of handmade small shoes just because they have to be tailored to fit my feet. I'm not talking about grabbing a pair of sale shoes on a whim just because you convince yourself that they might fit. I'm talking about the Cinderella moment. Stepping into a pair of shoes that really cling to your feet, and make you feel as though you're donning some slippers. This is why we are forced to turn to secondhand and vintage shoes. I've seen the looks people give me when I tell them that my shoes are vintage "worn before?" (looks in disgust). I don't see what the problem is as long as the shoe fits. 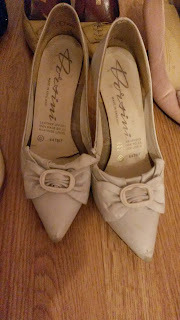 I will admit that I have quite a few pairs of vintage shoes already, but there's only so many times you can wear them before they begin to look shabby. 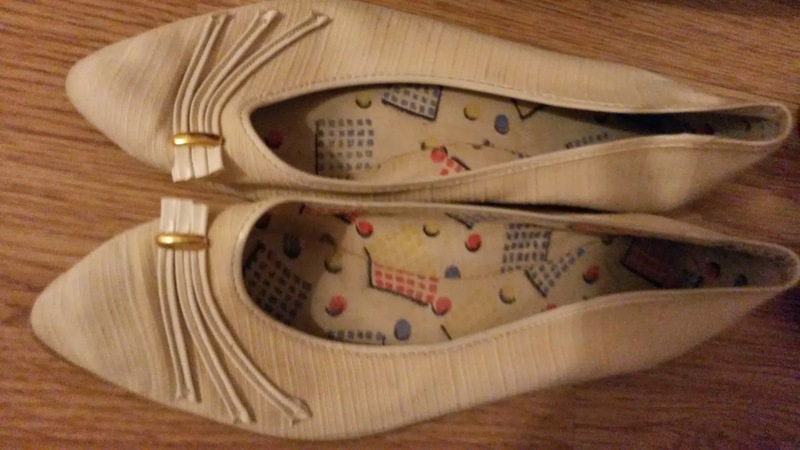 I bought my first pair from a vintage trader at University and they were completely unworn. She regularly visited the University with lots of big sized shoes and when I asked her about smaller shoes she replied "I have one pair that no one can fit into if you want to see them." A week later she returned and as soon as I tried them I knew. They were made for me. I think they may be 1950s or early 1960s. 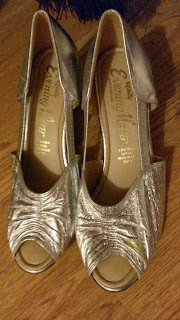 Either way they are beautiful dainty shoes and spurred me to find more of the same. 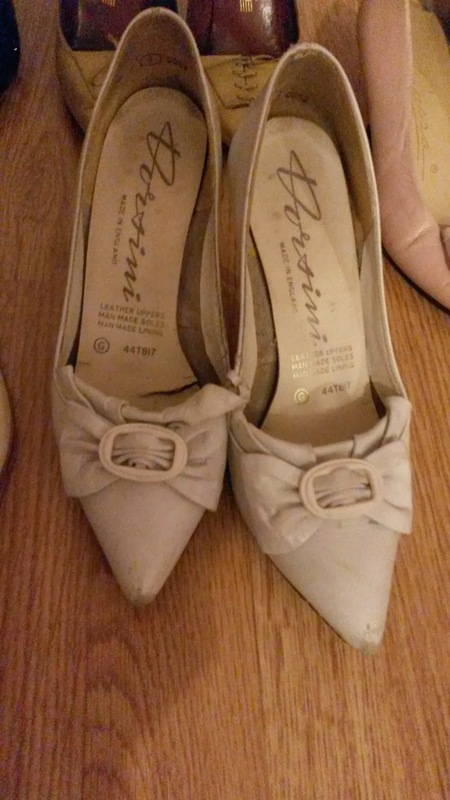 One of my favourite shops for shoes is Prim Vintage Fashion in Norwich, and during my time at University I indulged in the variety of stock available. On one visit I found a pretty pair of small pump shoes in cream with the most incredible printed lining. They look as if they have just stepped out of Hairspray (2007 version). Think "The New Girl in Town". Then when I went to visit a friend in Paris earlier this year I bought a pair of elegant mustard coloured heels by Capriccio which were surprisingly cheap for the quality of them. 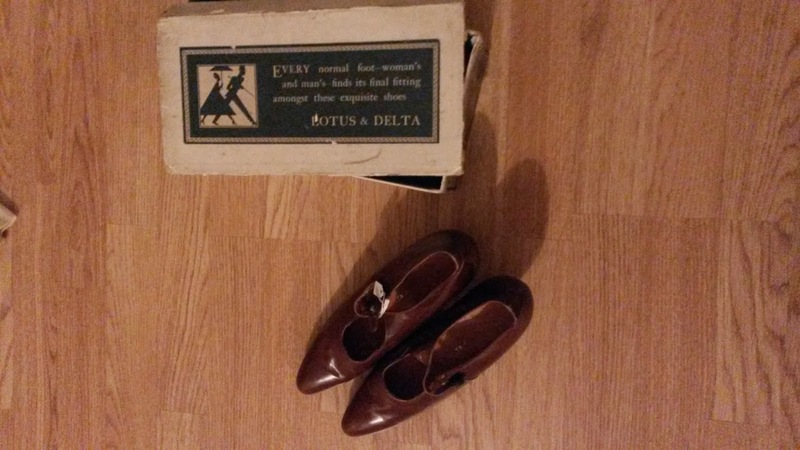 My love of vintage shoes has definitely grown since then! Which is why, recently, I have decided to invest in them. At every vintage fair my attention has been diverted to one thing and one thing only, petite size 2 shoes. I do not consider this to be a defect in my development, it has a lot to do with genetics, both my parents have small feet (although not as small as mine) however to be told constantly that nothing is in stock is a real drain. Then like an avalanche, size 2 shoes began to appear on Facebook vintage groups and shops and I began to build up quite a collection. A trip to London brought a pair of 1940s Harrods "Delamante" shoes into the wardrobe (which are sadly quite worn now due to my wearing them to work on a regular basis) and on a visit to one of my favourite vintage shops, Mela Mela in Teddington I found a pair of gorgeous 1950s silver dancing shoes for just £30 and bought them. Then I came across a pair of 1950s red shoes by Crespino on the Frock and Roll Vintage Clothing page and bought those as well. When they arrived I was quite surprised by the lining. They are decorated with a figure of a girl in a pretty dress. 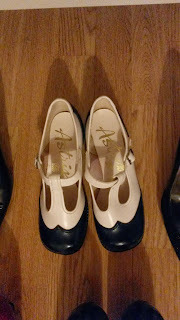 A search on eBay found a pair of unworn 1960s buckle shoes and I purchased them. Perhaps my best investment, however were a pair of 1920s shoes by Lotus and Delta, bought as a present for me at The Clerkenwell Vintage Fair. They are without doubt the most beautiful shoes I have ever seen. So immaculate I feel they should be kept under glass in order to preserve them, but what is the use in that if they are my size. Should I wear them? If not, what should I do? Has anyone else found it hard to get shoes? I can only suggest that those of us in what I am calling the "Size 2 Club" focus on buying vintage shoes and boycott the high street altogether since they have shown no interest in helping us. If anyone else shares the same view, I'd like to hear from you.